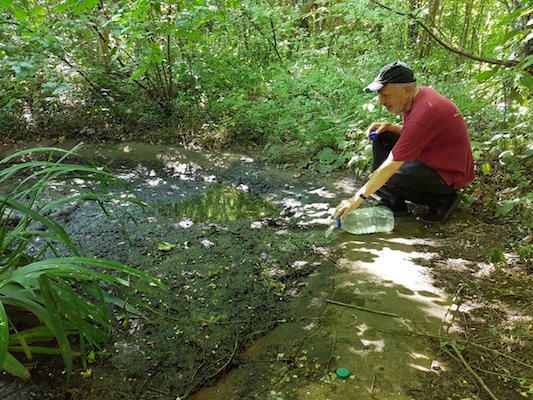 This woodland dew pond is concrete lined and normally holds about 1,500 litres of water. Full of decaying leaves it supports a large colony of shrimp like freshwater crustacea. The pond’s thick layer of duck weed and shading usually stops it from drying out but this dry weather has been too much for it. Birds, deer, badgers and other creatures rely on this water. On Monday 23rd July, John, Christian and I ferried about 100 litres of water in 2 car loads up to the pool. Although we had brought some filled bottles from home, we filled the remaining assortment of plastic bottles in the toilet block. As the pictures show the water was poured into the edge of the pool but it will quickly be used up or soak away. 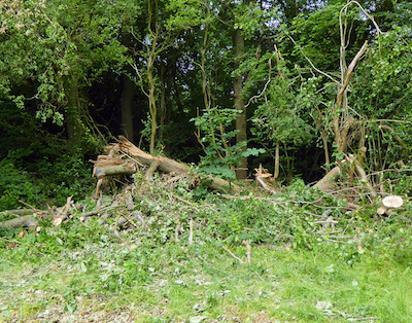 24/5/18 - A major tree fall in the Langford's Way Corner of the Great Field was too big for FSW to deal with so we reporetd it to the Council. It was cleared by Council contractors on 8th June. The top two photos show the fall and the lower two after clearance. 27/4/18 - First cut of pathways in field areas by contractors. For information about this annual work see the section on Commercial Coppicing in the Wend below. This article, Coppiced Woodlands and Their Management for Wildlife, provides full information about the history of coppicing and its value to biodiversity. Click here for a full explanation of all this management work undertaken by Croydon Council. On 31/8/17 - Contractors were out trimming back along pathways and cutting grass - here spotted in Linden Glade. As in many previous years, Council contractors are currently undertaking woodlands works to improve the biodiversity of the wood. Organisations such as the RSPB and Plantlife have identified that under-management is the major threat to woodland plant life and other wildlife that depends upon a rich woodland flora. 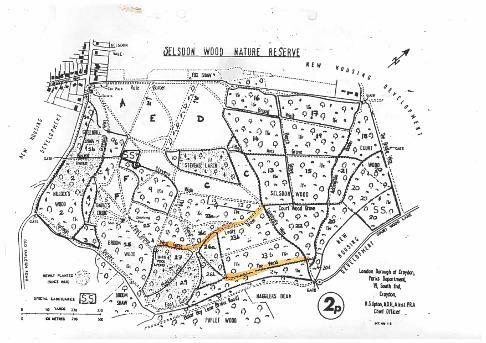 This year they will be widening the paths shown on the accompanying map to let in more sunlight and link areas where regular work is carried out. These works, together with annual coppicing, aim to address the threat of under-management by creating short term open space. Whilst works are being undertaken rides may be temporarily shut and there will be tractor movement so please follow any safety notices or diversions. Please contact the Trees and Woodlands team for further information. Photos show work in progress (top) and the large logs being collected and moved to the log store in Vincent Avenue on December 2nd (middle left). The log store is now well stocked (middle right - Dec 3rd). More logs were piled in the following week (see tractor adding to the pile on 12/12/16 bottom left) and some numbered logs (the most high-quality Oak timber which is being sold) were stored on the opposite side of Vincent Avenue to the log store (bottom right 12/12/16). On 17th February Simon Levy delivered 100 Hazel, 6 disease-resistant Elm and 6 Wild Service whips, plus 25 large stakes and 25 plastic tubes to FSW. 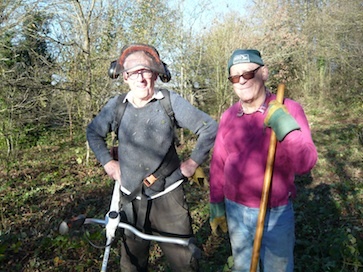 Ted Forsyth organised their planting in the FSW coppice area next to Stevens Walk, assisted by David Malins and Alan Bushnell. The whips were planted over two days later in the same week and at the same time a check was made on the existing Elms which were planted couple of years ago. Only one seemed to have vanished and even those not protected by a plastic tube seemed to be OK.
On the first day the new Elms were planted and stakes and tubes put on the old ones which had no protection. Rootgrow was used when planting. This is mycorrhizal fungi in granular form intended to give a good start to newly planted trees. They will form a close relationship with the tree roots and spread out to bring in nutrients from greater distances than the tree's roots can reach. 75 Hazel whips were also planted on the first day. On the second day Alan and David planted the remaining 25 Hazel whips while Ted dealt with the 6 Wild Service trees. Eight remaining plastic tubes and ten stakes were spread around arbitrarily to protect a few of the planted Hazel - most of the Hazel has no protection. Before leaving the deer fence was re-erected to protect the planting. The photos below show Alan and David working and a group of 3 Wild Service Trees with stakes and tubes. For several decades a strip of coppice has been maintained along The Wend. 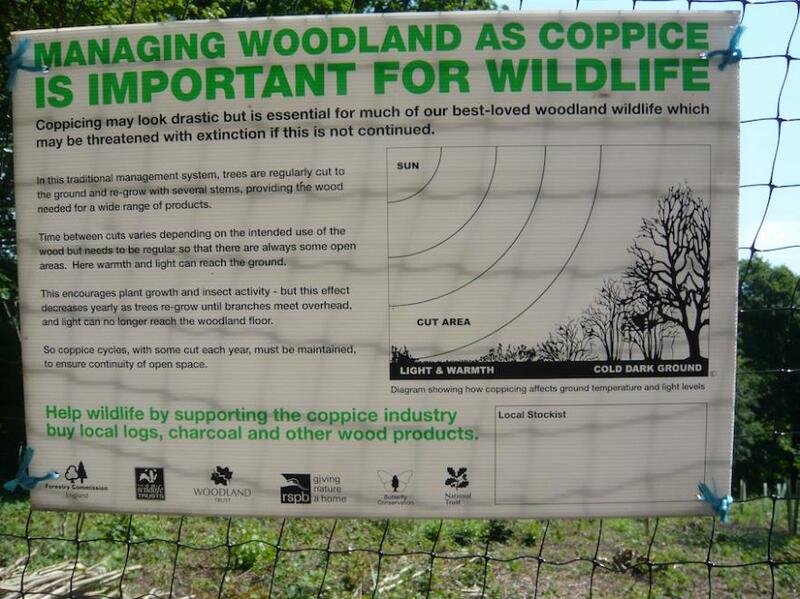 A poster displayed there - see below - explains the value of this traditional woodland management system..
For many years the seasonal work was carried out by Rob Sowter who worked under the supervision of Croydon Council. Following his sad and untimely death in the autumn of 2014, a new contractor John Sinclair took over the rotation for 3 years. In 2017/18 he moved out of the area and Jake Whitecroft took over the work. If you wish to purchase poles, pea sticks etc. please get in touch with FSW through the Contact Us page or email. The FSW have placed a tribute bench to Rob Sowter beside the coppice strip at the junction of The Wend and Noakes Way. We hope that you will enjoy sitting there to listen to and watch the birds. See the Seats page for more details. In spite of the vigorous cutting back in last winter the commemorative Oak stand in the Centenary Plantation was very thick with Ash saplings and brambles by the end of the summer. Malcolm Bridge and Ted Forsyth of the FSW did the job this time spending a couple of days in there with a brush cutter with a special curved blade. The photos show them and the finished job on 22nd November 2015. Simon Levy (foreground) was supervising the loading by the log store this afternoon. Manipulating that crane is a skilled job - nothing like as easy as picking up sticks! The log store has been especially well stocked this year and as the logs are such uneven sizes the task is especially difficult. This wood was cut in 2013 and 2014, mostly in the areas adjoining Leafy Grove, by Council contractors. It has been sold on the open market to subsidise the costs of work. 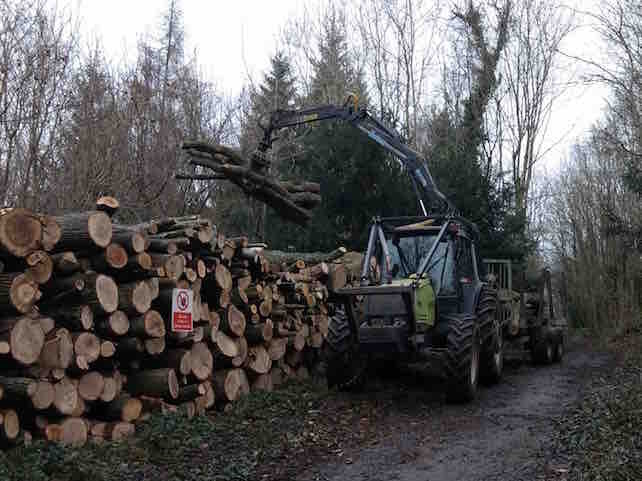 The purpose of the felling, carried out as part of the 5 year development plan, is to sustain a healthy wood with some under-storey and new trees are planted to provide succession. This prevents it all becoming high forest and helps to encourage more varied plant growth and bird life. Simon told me these purchasers of our timber had come all the way from Shropshire. The commemorative Oak stand in the Centenary Plantation was getting very overgrown with Ash saplings. On 16th February 2015 the council contractor Quadron cut down most of the invasive shoots using an interesting remote controlled machine about the size of a ride-on mower. The machine is usually used for cutting sloping banks but it (and its very friendly operator) made an excellent job of the Centenary. The cutting was very timely as the white helleborines, previously noted in this area, have not yet started to grow. FSW would like to thank the Quadron staff for doing such a grand job. They took good care of the existing trees and stacked the arisings in the dead hedge. The work was quite up to the high standard they have shown in their other work for Selsdon Wood - trimming the paths, particularly through the wood and it is much appreciated. The contractors were out in force with four tractors, two with fork lift attachments, two trailers and a baler. When I arrived at the top of Green Hill at around 1pm I photographed the view shown above. The hay had almost all been gathered into these cylindrical bales by the tractor on the right with just a few rows of hay left to gather on the far edge of the field. 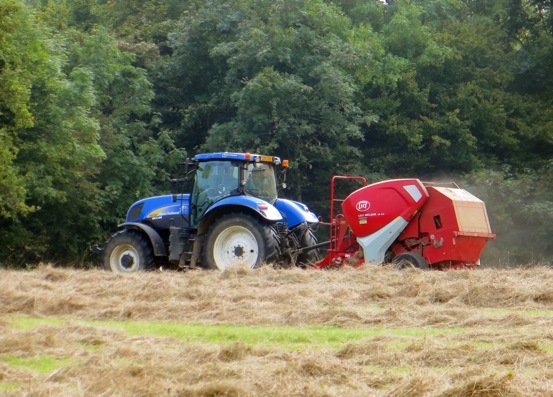 The baling machine was amazing - just scooping up the hay as the tractor drove over it and automatically disgorging a bale after about two lengths of the field. 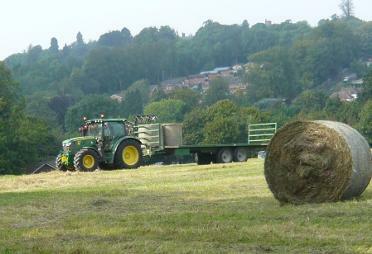 Here it is in the photo to the right dropping the last bale. Most of the bales were around the edges of the field with a few near the FSW seat which is where I sat to take photographs. 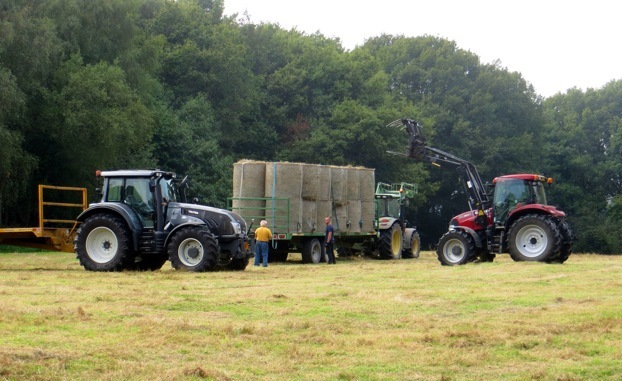 The tractor in the car park had just arrived with a huge fork lift for gathering the bales and the green tractor down at the bottom of the field had a long trailer for collecting the bales. As I watched the forklift came from the car park and picked up the bales as shown above and carried them to place on the trailer which had now come up the field. I had walked through all the other fields on my way and the hay in those was not yet gathered although it had been raked into the straight lines shown below. 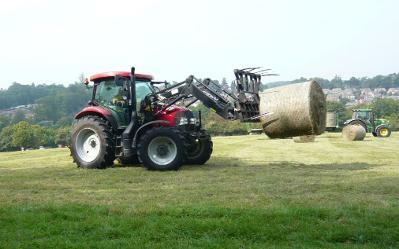 Later Tony Flecchia saw the baling work in the Great Field where the trailer can now be seen to be almost full. Thanks to Tony for the following two photos. 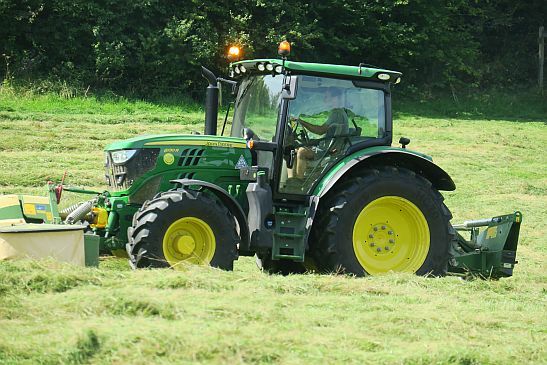 I asked the Council for information about the contractors and what is to happen to the hay. The work was done by a farmer called Ian Bushell who is subcontracted by Quadron - the contractor that does all the footpath flailing in the woods. 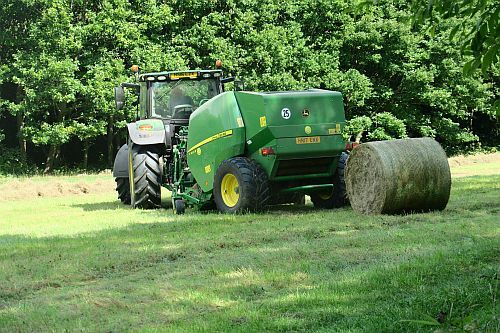 As part of the contract, Mr Bushell bales the hay and sells it for silage to offset his costs. My understanding is that the hay quality is not good enough for fodder - partly because of the copious Yellow Rattle which is parasitic on the grass. However, the up-side to this is that the weakened grass allows more wild flowers to grow so it is good from a biodiversity point of view. We also assume that for this work Mr Bushell enlists the help of other farmers. The clue to this is the fact that the tractors are all different colours. Tony Flecchia, whose brother was a farmer, informs me that tractor makers have identifying standard colours. They also have custom colours that buyers can choose and the grey one is either one of those or one of the newer imports. Farmers are practical people though and usually just buy in the maker's colour. The others in the photos are:- the blue one is a New Holland (if it had been a lighter blue it would have been a Ford), the green one is a John Deere and the red one is a Massey-Ferguson. Most individual farmers buy from just one maker so the diversity of colours suggest that several separate farmers are working on the job. For many years there have been wooden posts around the car park to prevent access of unauthorised vehicles. In 2014 a number of these had rotted at the base and fallen over which laid the fields open to possible traveller intrusion. As most of the other posts were also rotting the Council decided that a better and more permanenet solution to the problem would be to install a soil bund - a raised bank - around the entire length of the car park with a couple of small gaps for pedestrian access. This was created by Council contractors during the summer of 2014 and completed with topsoil and seeding by the start of August. After couple of weeks of ideal growing weather (warm and wet) the grass was coming on nicely. This photo shows the access point in front of the notice board on 16th August 2014. This work took place at the junction of Steven's Walk and Langford's Way from February 2008 to March 2014. See map below for location. 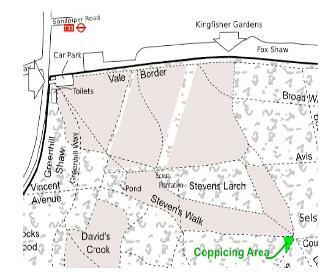 The FSW have prepared a set of guidelines for coppicing, which can be downloaded from this link. Print on both sides of an A4 sheet and fold to an A5 booklet - Harvesting Coppice. The photograph (5 May 2015) shows a young man called Jake Whitcroft in our coppice area putting up deer fencing. 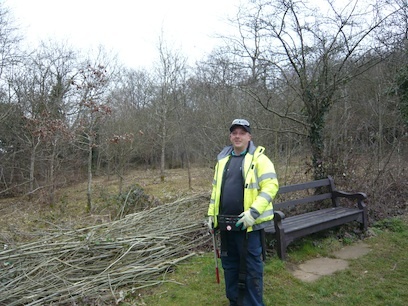 He is a freelancer offering "Woodland, Garden and Greenwood Craft Services" working there under Council commission, The area had been left unfenced since the FSW completed the coppice work in the spring of 2014 and had suffered some deer damage. 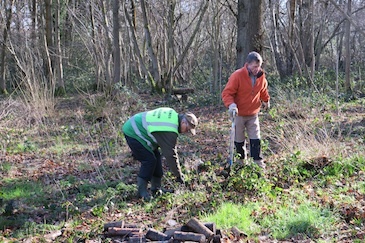 Management for Sustainability - who looks after Selsdon Wood? 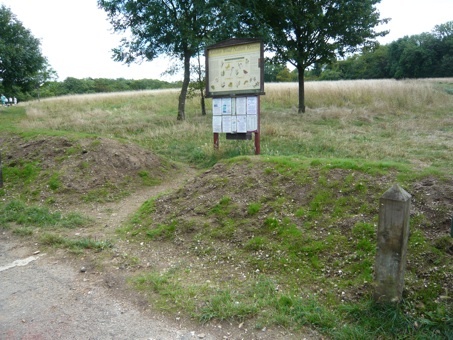 Although the site is owned by the National Trust and their bye-laws apply, the management responsibility lies with Croydon Council who hold the land on a 999 year lease. Selsdon Wood is a Local Nature Reserve (LNR) and is classified as Ancient Semi-Natural Woodland (ASNW). Within it there are a number of Plantations on Ancient Woodland Sites (PAWS - see the separate page on these for more information). These require active management. The managed ancient woodland is looked after by the Council's Tree and Woodland Officers following a set management plan which ensures the wood's sustainability. Like all Croydon's woodlands, the management of Selsdon Wood is regularly audited for Forest Stewardship Council (FSC) certification. This certification is an internationally recognised standard of good forestry management only attained by organisations that are audited as meeting the UK Woodland Assurance Standard. The Council's Forestry Advisor, Simon Levy, carries out an inspection at least every three years. 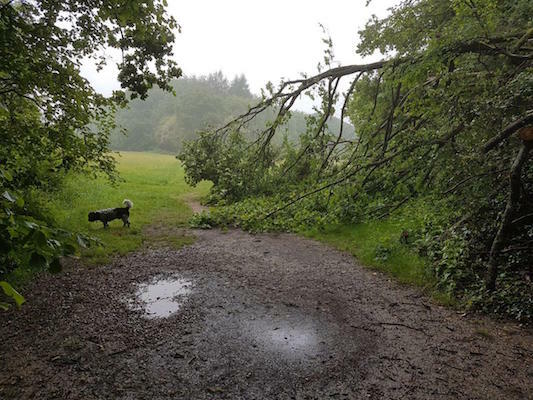 Any dangerous trees likely to fall on paths are marked to be either taken out or trimmed to make safe. A map of the marked trees is supplied with instructions to external contractors who do the felling. The usual idea is to leave standing trees if possible as they are used by insects and various birds. Some of the healthy trees are taken out to let in more light and encourage the growth of younger trees so that there is not a tendency to go to high forest of trees roughly the same age. A range of ages is necessary so that insects, birds and plants will thrive. Coppicing is carried out for similar reasons - it not only allows the hazel to regrow in a way that will allow the stems to be used later, but it opens up an area to the advantage of ground flora, the insects that use it and the birds which nest in the undergrowth. 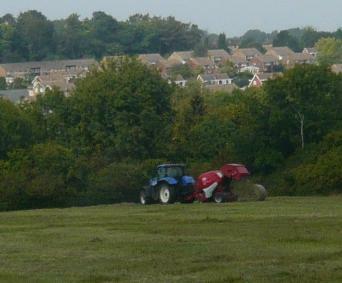 To maintain the flower rich chalk grasslands, the five meadows are cut annually by a farmer called Ian Bushell who is subcontracted by Quadron. This is the same company that does all the footpath flailing in the woods and regularly cuts the paths through the grasslands. The Friends of Selsdon Wood now make an active contribution to the management of the reserve - both in the planning and the work. 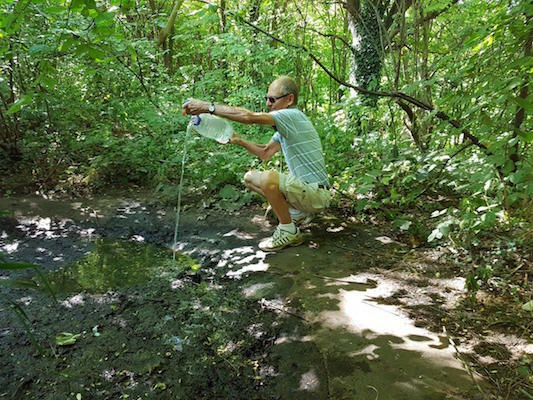 With our limited human resources, we do what we can to keep Selsdon Wood Nature Reserve a suitable habitat for wildlife and visitors. 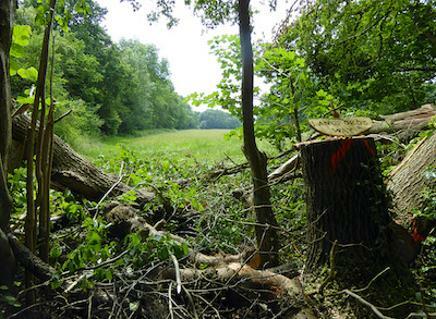 Sometimes there is concern about felling trees in Selsdon Wood. The Council’s primary objective in managing this National Trust Nature Reserve is biodiversity and amenity. Selsdon Wood is a Local Nature Reserve (LNR) and is classified as Ancient Semi-Natural Woodland (ASNW). Within it there are a number of Plantations on Ancient Woodland Sites (PAWS). Ancient Semi-Natural Woodland requires management to encourage diversification and to prevent it all becoming high forest. Active management had been stopped until the late 1990s and many areas show the results of this neglect. 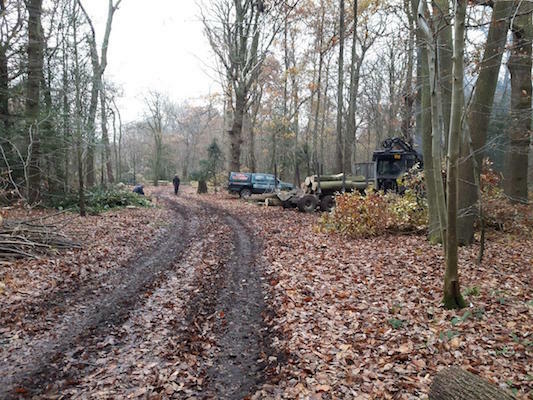 Now the woodland is looked after by Croydon Council’s Tree & Woodland Section following set management plans which ensure the wood’s sustainability. Like all Croydon’s woodlands the management of Selsdon Wood is regularly audited for Forest Stewardship Council (FSC) certification. This certification is an internationally recognised standard of good forestry management only attained by those organisations that are audited as meeting the UK Woodland Assurance Standard. The current Management Plan is dated July 2009 and will be reviewed in 2014. 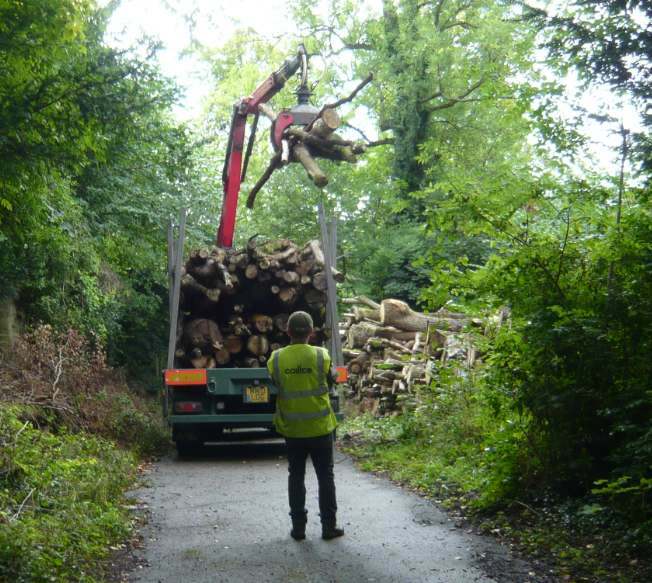 The timber from Selsdon Wood is a valuable resource and the Council sells it for chipwood, firewood, sawlogs etc. to help finance the woodland operations. Contractors cut the timber; some of which is left onsite to season. For hazel coppicing - the contractor sells the product instead of being paid. 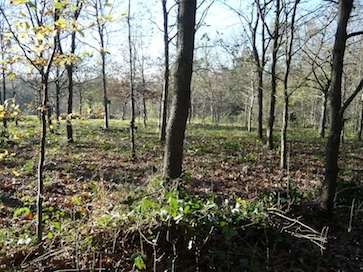 The Friends have coppiced a plot and they improve habitat and diversification by thinning areas of woodland, mainly of introduced trees. They sell charcoal and logs to help fund their activities. Inevitably the initial sight of felling and its removal is unsightly but nature soon covers the scars and the wood becomes a more diverse and attractive habitat. a. Felling either side of Beech Grove - The felling of trees in some areas is to encourage natural regrowth and to allow replanting. This is necessary in order to sustain a healthy wood with some understorey and to provide succession. This prevents it becoming high forest and helps diversification. b. 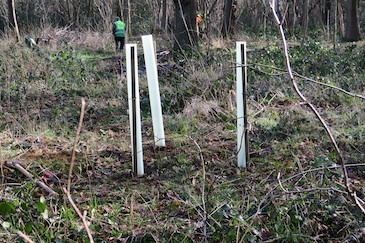 Clearance in and around the Jubilee Plantation - This is to reduce the dominance of sycamore and ash and allow the growth of 260 whips planted by the Friends and 60 whips by Selsdon Brownies to aid diversification and provide a more bird friendly habitat. Silver birch, elder, field maple, wild service, hazel, spindle, wild cherry, guelder rose, wild rose, blackthorn and dogwood have been planted. Some coppicing and pollarding is still needed to improve the understorey in the rest of the plantation. 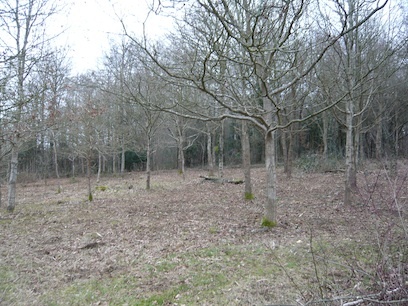 Coppicing either side of The Wend - This is a commercial 4 hectare hazel coppicing regime with standards. Plots have been coppiced on a nine year rotation to produce pea sticks, bean poles, hedging, tree stakes and binders. 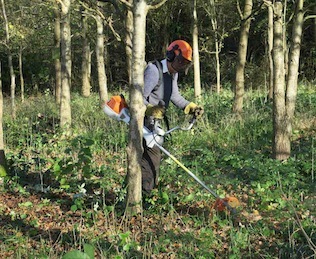 Coppicing is a traditional woodland craft and involves cutting a bush or tree back down to its base which results in the re-growth of straight shoots. This management practice creates a more open habitat benefiting butterflies and nesting birds which enjoy the mosaic of light and shade. Willow warbler has returned. 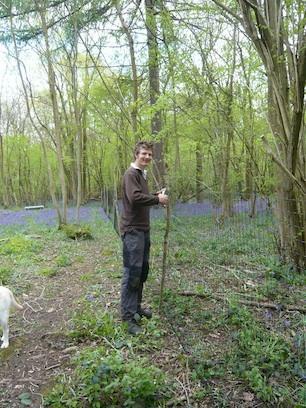 Sadly Rob Sowter, who maintained this coppice died on Wednesday 15th October 2014 after a battle with cancer. He was an enthusiastic woodsman who helped us to develop our interest in coppicing and charcoal making, and certainly made a big difference to parts of Selsdon Wood. He will be much missed. a. Felling larches between Middle and East Gorse - The larches were nearly full grown and should have been thinned many years ago if it had been intended that they should become a permanent part of the wood. Thinning now could have left spindly unsafe trees without balanced branches. They were becoming unstable and action had to be taken. The Management Plan was to fell these larches and see if gorse would re-emerge. This would return part of the Gorses to a previous habitat which would increase diversification. The plan was highly successful and the plot is now covered with hundreds of gorse bushes. Gorse was probably grown as fuel for lime-kilns or winter feed for stock. Many larches still remain between Middle and West Gorse and in other areas. b. Thinning Scots Pine in Stevens Larch - The Scots Pine was becoming overcrowded. This work was undertaken in 2009. Cutting down Laurel & Sycamore - Laurel is a Mediterranean species, probably introduced into Court Wood to give cover for game birds. It is spreading steadily by suckering, layering and seeding and it is inhibiting the growth of other plants. Laurel poisons the ground beneath it. The Friends have a programme to control Laurel. Sycamore was also introduced and is being removed. The main thrust of Friends Workdays in autumn 2014 has been the felling of Sycamore in Greenhill Shaw. Some felling is for safety reasons. For further information please contact the Croydon Trees & Woodland Section. Tel: 020-8726 6000 Ext. 62387.